Greece has a tremendous selection of locally-made inexpensive, high-quality toiletries and beauty products made with indigenous ingredients. If you're traveling with carry-on luggage only, you may want to stock up on these once you arrive in Greece, then pack them and check your luggage on your return trip back from Greece. Most are available at Greek pharmacies and small tourist-oriented markets. In general, try or smell before you buy when you can. The pretty tourist-packaged items are expensive and often not as good - don't get stuck with something you won't use. Remember, these products are all manufactured under stricter European Union rules - which exclude many ingredients routinely included in U.S. brands as being too toxic, which may be another reason to stock up. If you are buying larger items at the Duty-Free stores, more than the 3 oz carry-on limit, remember that if you have a connecting flight once you are back in the United States, you will have to put your duty-free items into your checked bags when you pick them up to clear customs. Don't risk losing your new purchase! The duty-free bag will not get you through security once you are in the States. 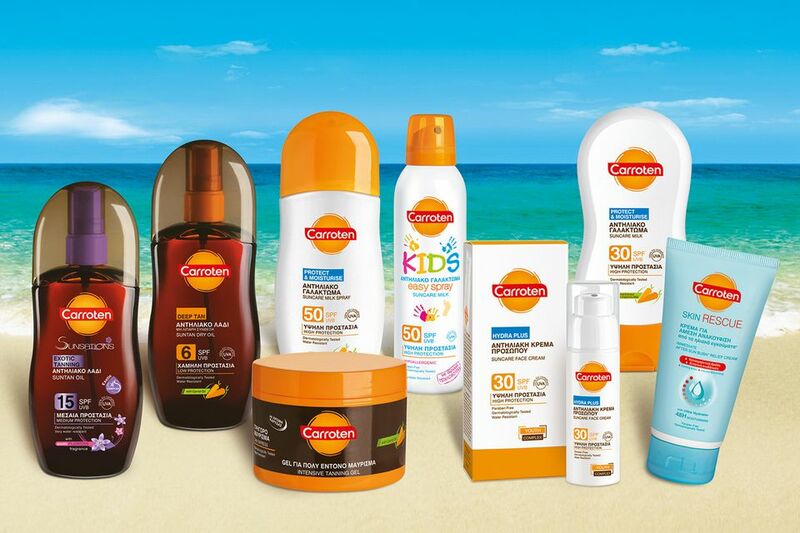 Carroten used to be my secret weapon against high sunscreen costs - then they got tired of being the 6 Euro alternative next to the 14 and 18 Euro competition. Now their prices are about the same, but their product is excellent. No, they won't make you orange like a carrot, but keep an eye out for their orange packaging. It usually is still priced slightly less than imported brands. Their lip balm is said to be one of the few to stand up to the Greek sea and sun. Apivita first came to my attention because they offered a free Minoan-themed screensaver which I found charming. On my next trip to Greece, I bought their basic skin regime at the Athens Airport pharmacy for the princely sum of 19 Euro for two jars of cream, one for general use and one for the eye area. These both absorb quickly and I had very good results with them, equivalent to much more expensive products. But their stimulating, cooling mask for feet and legs zapped my overly-sensitive skin. Apivita has now crossed the ocean and is available in the United States at Ulta beauty stores and elsewhere. This decadent body butter is made with organic olive oil and is irresistible. A yoga teacher turned me on to this brand. I bought a huge jar of it for less than 6 Euro and bought a second one to bring home intact. I've also used their foot cream and hand lotion, all with excellent results. Lots of brands sound similar - this one is "HerbOlive" as one word with a leaf design. This is often found in small markets in Greece. The Greek company behind this line is Madis based on Crete. This is another high-quality plain-wrap brand with low prices and good products, with many olive-based items. The hair mask - for some reason, almost everything is a "mask" in Greek beauty supplies - seals and conditions the hair and gives it more volume. I adore the scent of Korres lotions which are wonderfully enticing. However, for my very sensitive skin, I found the concentration of essential oils to be too strong. Very regretfully, I left my lotions behind since they were irritating to my skin. You probably will not have this problem, and I envy you! Their cedar and amber scents are terrific. This line is also sometimes available on home-shopping channels in the U.S., and they have a few exclusive shops in the States as well. The pharmacy near Door 4 in the arrivals area at the Athens International Airport has a great selection of beauty and health products, with knowledgeable clerks who will help you. I love the Korres line of shampoos which are so effective and rich, you won't need to follow up with a conditioner. A bottle costs about 6 Euro. My favorite? The "Sage and Nettle Shampoo for Oily Hair". It's excellent and I'm hoarding my last bottle until I get back to Greece. Yes, I could now buy it online but it's the principle of the thing. This one is expensive - about 16 Euro a bottle - which actually makes me sorry it is so excellent. I was using it without thinking about it and suddenly realized the skin on my legs had vastly improved over just a couple of days' use. It's available widely in Greece and is also carried in small markets. The same company produces the Olivelia line as well. Their website has an engaging background soundtrack of tweeting Greek birds which also amuses my cat. So far, their products are only available in Greece. This toothpaste is flavored with a resin from the island of Chios that has been proved to be very beneficial for your mouth health. The flavor is unusual but easy to get used to using. It's available at the Athens Airport in the Mastica Shop (which is a national chain you may see elsewhere as well) and in local pharmacies and some markets. You'll also find mastica-based candies, lotions, soaps, and other products. This is a great souvenir item, so buy plenty. Some are packaged with magnets or metal medallions as an extra enticement. Most brands are similar, so smell them, see what the best price is, and enjoy yourself. Don't pay more than 2 Euro a bar; you can find it for much less a little off the beaten path, or in markets where Greeks shop. Here is a reasonably-priced olive leaf extract from Olympian. Fans claim all sorts of benefits for the substance, which often demands much higher prices. Unique Gift Baskets from $24.99. Satisfaction Guaranteed. Buy Today! Find Cheap Flights to Greece Today. Trusted by 26 Million Travelers. In recent years, essential oils have become much easier to find and many of them are processed from the local herbs, flower, and fruits of Greece. Essential oils are usually used in aromatherapy, and many Greek spas also use these local oils that way. Since they are so concentrated, they cannot be used as perfume directly on the skin, though they can be diluted if you wish. Depending on the variety, they can range in price from a few Euro for a small dropper bottle up to about 20 Euro for rarer oils. Generally, essential oils are not to be ingested and some can be toxic or cause allergic reactions or sensitivities in some individuals. Oddly enough, I rarely see basil oil or oregano oil, both of which would be nice additions to this list. I keep all of my Greek essential oils in one chest and the aroma of them all together takes me instantly to Greece. Apivita, Korres, and BioSelect all offer essential oils. Some of them are combined into blends for specific purposes. Many other companies also offer products scented with essential oils. The fragrance of herbs in Greece is renowned - the hot dry climate tends to concentrate the essential oils and make them more potent and fragrant. Check your country's import regulations, but in most cases, dried herbs are acceptable. Most herb shops will also have natural soaps and other body products infused with Greek herbs. One of my favorite herb shops in Greece is Maravel Herbs in the town of Spili on the island of Crete. The proprietor makes many herbal products himself, including creams, lip glosses, and fragrance sprays. You also can't beat Greece for purchasing saffron - it may have been originally discovered and propagated by the ancient Minoans of Crete. These days, the Kozani region is renowned for the expensive herb. It's high quality, with far less undesirable white portions on the saffron threads than I've seen on highly touted Spanish saffron sold at big-box retailers in the United States. Secret tip? Buy it at a grocery store, the more Greek the better, rather than at a souvenir shop. This is good advice for buying almost any herb in Greece. They often will have been stored better and be fresher than the souvenir store stocks. I love Greek Mountain Tea - which can be purchased in souvenir shops as dried herbs or in grocery stores for about a Euro or so for eight or ten tea bags. It's supposedly a panacea for most ills and is said to give strength for clambering over the mountains - which is helpful for more vigorous sightseers. Dittany of Crete can also be purchased as a premade teabag, or in bulk bags. In many places, locals use ancient salt pans to gather sea salt. This often will be bagged up - sometimes in a standard Ziploc-type baggie - and sold to tourists. It's wonderful - don't miss the opportunity to bring some home if it is offered. It sparkles like diamonds in the sun. It truly tastes like the seawater you accidentally swallowed just off shore. You don't have to be Greek Orthodox to enjoy the many scented products from monasteries and convents in Greece. Look for myrrh oil and rose, frankincense, and myrrh resin incenses to be burned over charcoal. You can also find marvelously fragrant pure beeswax tapers which will immediately remind you of all the many small chapels you will have visited during your trip to Greece. At Athens International Airport, you can take advantage of the duty-free purchasing areas on huge varieties of internationally-famed perfumes at a discount. While few of these have a direct Greek connection, they still fulfill Cavafy's advice. Remember that the usual carry-on restrictions may apply, so go for the smaller items or do your shopping before your check your luggage. If you are at the airport and want something more authentically Greek, stop by the pharmacy in the arrivals area for selection of body products infused with various Greek scents and essential oils, or visit the Korres Body Products shop or the Mastica Shop which features dozens of products made with the rare, fragrant resin from the Greek island of Chios. I like the toothpaste, candies, and essential oil - which can be used sparingly in cooking some Greek specialties. While these can be a challenge to pack safely enough to carry home, the islands of Greece offer a number of fragrant liqueurs which can evoke Greece through both flavor and scent. Some of the ones to watch out for include the Mastica-flavored liqueur from the island of Chios and the Dictamos Liqueur from the island of Crete - the latter is reputedly an aphrodisiac and is sometimes sold under the alternate name of the herb, which conveniently enough for such marketing purposes is "Eros" or "Erodes". Metaxa is also flavored with herbs and rose petals, with a strong flavor that may not work for some. Try it in Greece before hauling a bottle home. The king of Greek flavored liquors, anise-kissed ouzo is available almost everywhere and is packed in souvenir-sized bottles. While the anise is the dominant flavor, it actually contains other herbs as well. The clear sharp-tasting Raki is also found in smaller bottles, but again, try before you buy. There are honey, cinnamon, and fruit-flavored (including local mulberry) versions of Raki which may please more palates than the sometimes moonshine-strong plain raki. What Are the Best Olive Oils from Greece?